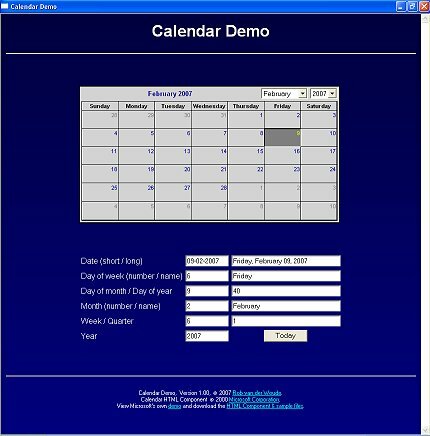 This HTA demonstrates the use of Microsoft's Calendar HTML Component. Pick a date in the Calendar Control, and each of the selected date's components will be displayed in the fields below the Calendar Control. Click the "Today" button to return to today's date. 1.01 11/24/2008 Corrected relocated links. 1.00 02/09/2007 First public release.